Essex Conservatories are leading suppliers of DIY conservatories, if you have ideas about building your own conservatory then it really could not be easier with the system we use and supply. If you have even the most basic of DIY skills then you will be more than competent to install a conservatory yourself, the locking systems we supply are so easy to install. With the right tools, skills and advice you will be building your own conservatory in no time at all. Essex Conservatories will guide you every step of the way through the process making it more simpler for you should you need it. We are proud to offer you our help and advice both before and after installation. The conservatories are made to the highest quality and the locking system allows you to easily put it together with even the most basic of DIY skills. The system we use allows you to lay out the sills and then slide the panels together, you then take a locking cam and slot it into place, you then turn lock it to secure in place. Most conservatories do not need planning permission; take a look at our guidelines on our website for further information. 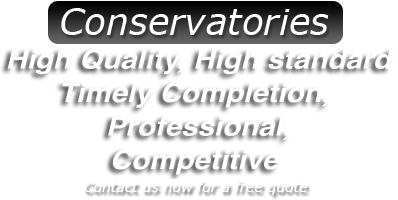 At Essex Conservatories we are able to advise you what is needed for your conservatory when we come to your property at the initial planning stages. It really is up to you what you decide to have as your base for your conservatory to be built on; you can choose to have a concrete base built or one of the newer and easy to install Durabases. Once your base has been built, the frames can then be fixed into place. The frames are all fully glazed before delivery. The panels are then attached to the sills and to each other by a very simple quarter turn button. All sills are cut to size and pre-routed. There are no screws and no drilling involved. Depending on the style of conservatory you require, whether it be a lean to, Victorian, Edwardian or something different the roof will actually determine what your finished conservatory will look like. Installing the roof is as stress free and simple as installing the rest of your conservatory. The finishing touches are an important part of completing your project and with internal panels it completes your conservatory to a high standard. 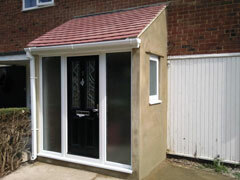 Internal panels are all custom made to suit each conservatory and are very easy and quick to install. Fitting panels saves you time and effort as there is no need for plastering, the panels looks incredible when painted. Essex Conservatories can give you more information on panels should you require it. The options you have for the base of a conservatory are either to have one built from scratch i.e. concrete base or you buy a Durabase system which is easy to install. With the latter base type you don't have to dig the footings to lay your foundations you simply put it together based on the instructions included. This kind of bespoke conservatory base and modular walls are always manufactured to order by the professional staff at Essex Conservatories, it is delivered to you on site and in kit form, ready for installation by yourself.